The price of Bitcoin is increasing at an exponential rate and it’s going to continue at least until it is worth between $20,000 and $100,000 / 1 BTC. Here is why! 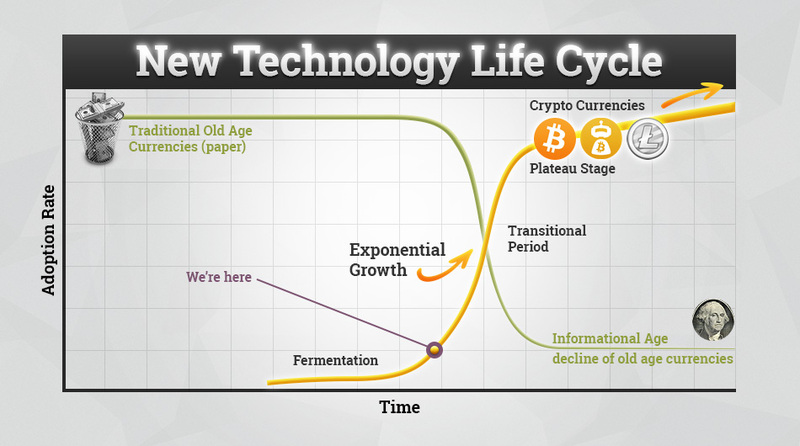 We are in the beginning of the stage called Exponential Growth. The more people use the new Bitcoin technology the more useful it gets for everyone involved. This effect accelerates the adoption. With crypto currencies we’re at the beginning of this stage. The benefits of crypto currencies increase as more people have wallets and more merchants accept it! You could be among the first pioneers who take advantage and reap all the benefits and profits!